Irish breakfast tea is from Bewley's. This fine Irish blend consists of top quality small leaf Darjeeling and top quality Rwanda and Assam Indian tea. It has a creamy, malt flavor with a pleasant aftertaste. A strong, invigorating tea, rich in flavor and quality. 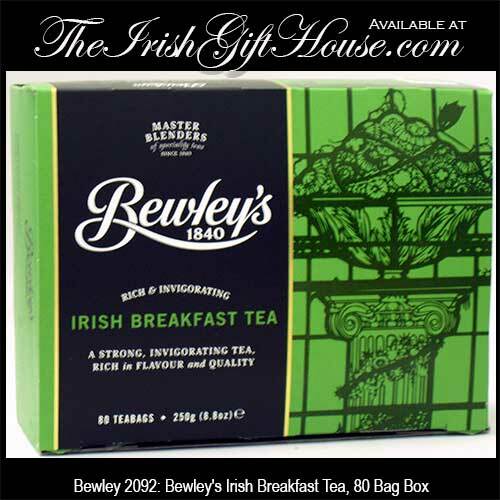 Bewley's Irish Breakfast Tea is served in Bewley's Cafes in Ireland. This box of Bewley's Irish breakfast tea features 80 tea bags with a weight of 8.8 ounce (250g). Bewley's tea is a product of Ireland.